The National Society of Film Critics on Saturday, January 5th, 2019, chose THE RIDER as Best Picture of the Year 2018. The Society, which is made up of 60 of the country’s most prominent movie critics, held its 53nd annual awards voting meeting as guests of the Film Society of Lincoln Center in New York City, using a weighted ballot system. To the team of producers, editors, restorers, technicians, and cineastes who labored for decades to bring Orson Welles’s The Other Side of the Wind to completion for a new generation of movie lovers. To the Museum of Modern Art for restoring Ernst Lubitsch’s 1923 film Rosita, starring Mary Pickford. SPECIAL CITATION for a film awaiting U.S. distribution: A Family Tour (Ying Liang, Taiwan/Hong Kong/Singapore/Malaysia). “One Way or Another: Black Women’s Cinema, 1970-1991,” curated by the Brooklyn Academy of Music Cinématek. Co-programmers Nellie Killian, BAMcinematek and Michelle Materre, Creatively Speaking. Special commendation to Dan Talbot for his pioneering work as an exhibitor and distributor, in bringing world-wide cinema to the United States. SPECIAL CITATION for a film awaiting U.S. distribution: Spoor (Pokot), by Agnieska Holland. This year’s National Society of Film Critics awards are dedicated to Richard Schickel, the legendary film critic and historian, author of 37 books and director of 37 documentaries, and a founding member of the Society. Nov. 7, 2017 — The members of the Los Angeles Film Critics Association, the New York Film Critics Circle, the Boston Society of Film Critics and the National Society of Film Critics jointly denounce the Walt Disney Company’s media blackout of the Los Angeles Times. Furthermore, all four critics’ organizations have voted to disqualify Disney’s films from year-end awards consideration until said blackout is publicly rescinded. On Nov. 3, The Times published a statement that its writers and editors had been blocked from attending advance screenings of Disney films, in response to The Times’ news coverage of Disney’s business arrangements with the City of Anaheim. Disney’s actions, which include an indefinite ban on any interaction with The Times, are antithetical to the principles of a free press and set a dangerous precedent in a time of already heightened hostility toward journalists. It is admittedly extraordinary for a critics’ group, let alone four critics’ groups, to take any action that might penalize film artists for decisions beyond their control. But Disney brought forth this action when it chose to punish The Times’ journalists rather than express its disagreement with a business story via ongoing public discussion. Disney’s response should gravely concern all who believe in the importance of a free press, artists included. The New York Film Critics Circle will vote on its annual awards Thursday, Nov. 30; the Los Angeles Film Critics Association will vote Sunday, Dec. 3; the Boston Society of Film Critics will vote Sunday, Dec. 10; and the National Society of Film Critics will vote Saturday, Jan. 6. 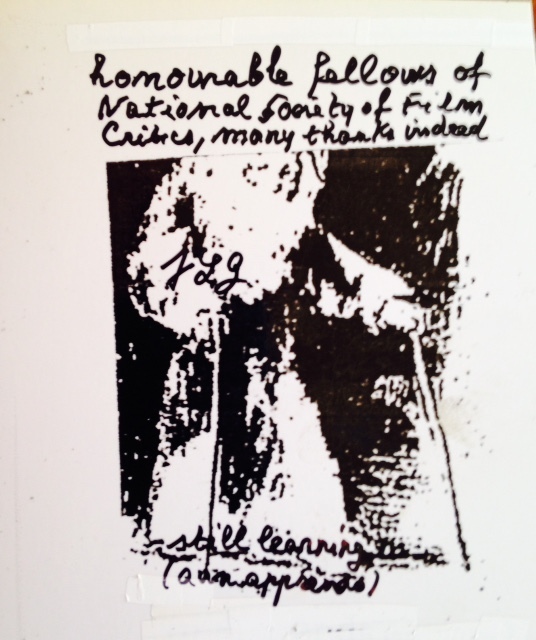 The National Society of Film Critics has been advancing the cause of great filmmaking and criticism for half a century. To celebrate, member critics have teamed up with curators from Boston to L.A. to choose from among the group’s fifty Best Pictures in order to present screenings with talks. Presentations have included Blue Velvet, Stranger Than Paradise, There Will Be Blood, and Life is Sweet. The complete list of Best Pictures is provided below. November/December – American Cinemateque, Los Angeles. SPECIAL CITATION for a film awaiting American distribution: One Floor Below, a Romanian film directed by Radu Muntean. This meeting was dedicated to the late Richard Corliss, longtime critic at TIME magazine, not just a writer of extraordinary intelligence, wit, and energy, but also a generous friend and colleague. Godard says the last line reads “aun aprendo” –still learning. It is thought that the drawing is by Goya. The National Society of Film Critics on Saturday, January 3, 2015, chose Jean-Luc Godard’s 3-D film Goodbye to Language as Best Picture of the Year 2014. The Society, made up of many of the country’s most distinguished movie critics, held its 49th annual awards voting meeting, using a weighted ballot system, at the Elinor Bunin Munroe Center as guests of the Film Society of Lincoln Center. Scrolls will be sent to the winners. Fifty-nine members are eligible to vote, though a few disqualify themselves if they haven’t seen every film. Any film that opened in the U.S. during the year 2014 was eligible for consideration. There is no nomination process; members meet, vote (using a weighted ballot), and announce all on January 3rd. There is no awards party; scrolls are sent to the winners. Here is a list of the winners and runners-up, with vote counts from the final round. 1. To Ron Magliozzi, associate curator, and Peter Williamson, film conservation manager, of the Museum of Modern Art, for identifying and assembling the earliest surviving footage of what would have been the first feature film to star a black cast, the 1913 “Lime Kiln Field Day” starring Bert Williams. DEDICATION: The meeting was dedicated to the memory of two distinguished members of the Society who died in 2014: Jay Carr and Charles Champlin. The National Society of Film Critics on Saturday, January 4th, 2014, chose Inside Llewyn Davis as Best Picture of the Year 2013. See the following pages for all votes in Best Picture and other categories for outstanding film achievement. The Society, made up of many of the country’s most distinguished movie critics, held its 48th annual awards voting meeting, using a weighted ballot system, at the Elinor Bunin Munroe Center as guests of the Film Society of Lincoln Center. Scrolls will be sent to the winners. Fifty-six members are eligible to vote, though a few disqualify themselves if they haven’t seen every film. Any film that opened in the U.S. during the year 2013 was eligible for consideration. There is no nomination process; members meet, vote (using a weighted ballot), and announce all on January 4th. There is no awards party; scrolls are sent to the winners. • To the Museum of Modern Art, for its wide-ranging retrospective of the films of Allan Dwan. • “Too Much Johnson”: the surviving reels from Orson Welles’s first professional film. Discovered by Cinemazero (Pordenone) and Cineteca del Friuli; funded by the National Film Preservation Foundation; and restored by the George Eastman House. • British Film Institute for restorations of Alfred Hitchcock’s nine silent features. DEDICATION: The meeting was dedicated to the memory of two distinguished members of the Society who died in 2013: Roger Ebert and Stanley Kauffmann. Jan 5, 2013 — The National Society of Film Critics, made of 60 of the country’s most prominent writers on film, today voted Michael Haneke’s “Amour” the best film of 2012. A full list of the other awards follows, with the winner designated by an asterisk and the first and second runners up listed with the number of votes each received. • To Laurence Kardish, Senior Film Curator at MoMA, for his extraordinary 44 years of service, including this year’s Weimar Cinema retrospective. • To Milestone Film & Video for their ongoing Shirley Clarke project.